The artist is indulged in the materiality of objects and ideas – to be able to push through what we think it could or might be. In the course of abstraction – using this medium to convey a singular purpose of transitioning material into meaning. 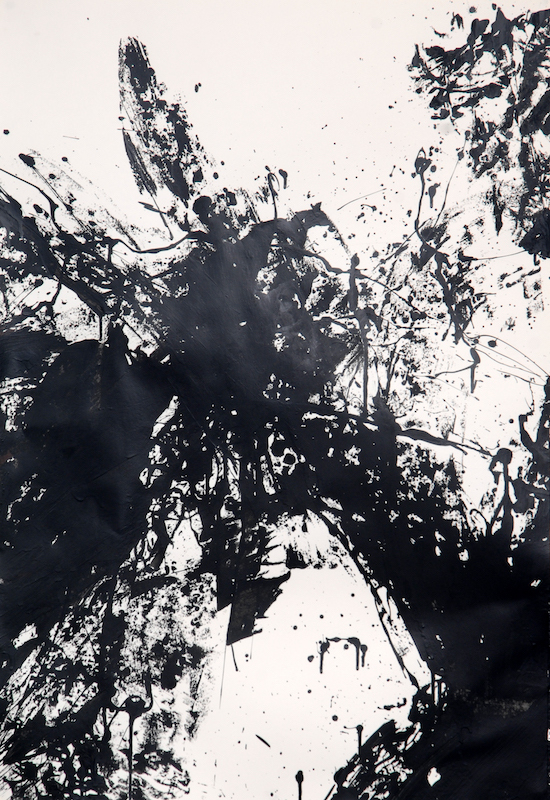 Similarly in drawing, the abstract message of the object drawn tends to be forgotten and its meaning lost. Sometimes perhaps we unconsciously hear this real harmony sounding together with the material or later on with the non-material sense of the object. But in the latter case true harmony exercises a direct impression on the soul, the soul undergoes an emotion which has no relation to any definite object, an emotion more complicated, more sensuous than the emotion caused by the sound of a bell or of a stringed instrument. The artist invites the audience to apply a specific mindset —a different kind of looking. It takes a mind quiet enough to appreciate muted beauty, courage not to fear bareness, willingness to accept things as they are — without ornamentation. It depends on the ability to slow down, to shift the balance from doing to being, to appreciating rather than perfecting. The process then explored the outcome. 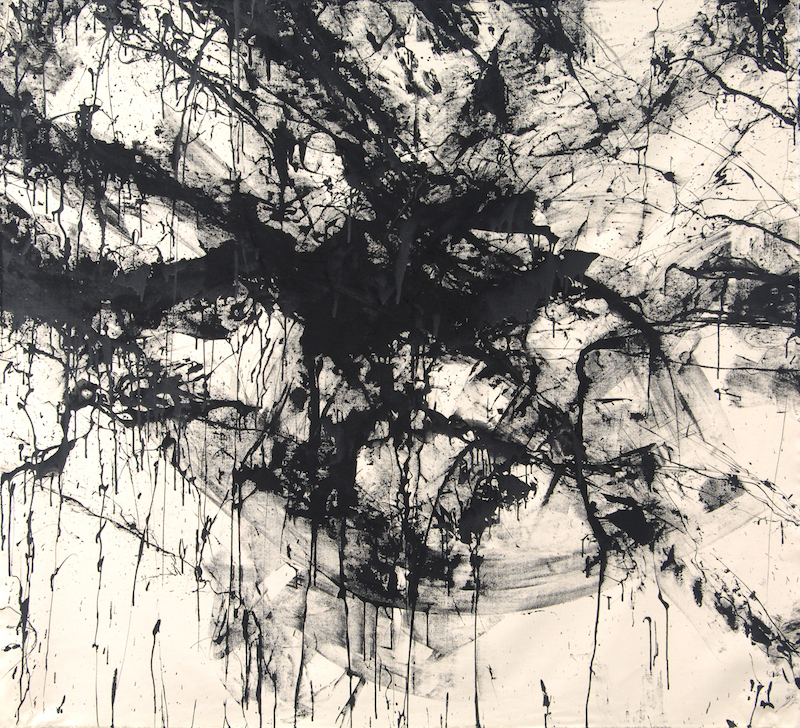 Such as artists from the gutai and abstract expressionists pioneered performance art, the artist then searched to unify time and space, two concepts that are divided by rational thinking, but become joined together in the sphere of action and flow of gesture and spontaneity merged further with conceptual, performance, and minimalist techniques. Brush strokes were arranged more separately and simply as opposed to of the former multi-layered approach. Moving to form ideology to the material, the artist then explored ideas in modern culture, as rooted from the concepts of modern technology and ideology, the artist conjures sculptural and immersive experiences using technologies that hark forward to fully networked, digitally assisted future of image and identity production. With the emphasis of radial formal experimentation – the artist communicates the fascinations that rooted from the aesthetic and technology to the world of spiritualism that further finds the conjunction between them. As the artist is based from the representation of modern Manila, the society mirrors the survival of creativity. The materiality of concrete and pavement, paves the way through an idea innate to the viewer. Concrete and pavement play a very important part in any nation’s infrastructure. Their construction, maintenance, and existence however, uniquely speaks to a culture. The sight of a concrete altercation or a perilous shaping of unsystematically stacked sand, rocks, wood, metal, concrete, can mean – energy used results in atmospheric emissions – reduction of a non-renewable resource—positive implications for a sustainable development – a day stuck in traffic – a sign of the next electoral project for a local politician – or a celebration of a time where childhood meant playing around brazen sites. Moving away from focus of the art object but more so on the engagement towards the invisible world of ideas, and to leave plenty of room for the audience to come up with potential meanings of their own in their relation of the present. The work is then thought to be able to invite and empower people to keep as a reactionary to themselves – Immersion with the use of light, sound and space creates art that breaks through the limitations of a confined frame but more delivers experiences of interaction with the audience themselves. Adding components to the more traditional concept with the growing and changing contemporary views. The aesthetic the artist wishes to create inner harmony, work that translates from its physicality which seem at first to create only a neutral impression have really a more subtle value. 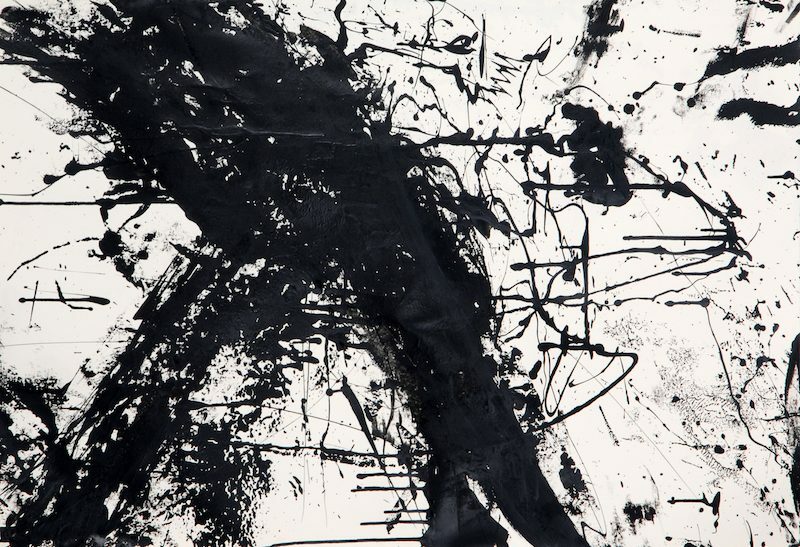 The work may spring this connection to the art and the audience receives the abstract impression of the ideology that dematerializes and deconstructs itself through the connection. The artist expressed a distance from the purely aesthetic, and strived for ways to constantly renew with the commitment to a systematic approach, generating the artwork with conscious decisions and relentless experimentation and almost nihilistically concentrated not what was applied but from what was removed further exploring the transience of and ephemeral state of being. The desire to physically engage with an extraordinary range of concepts, materials, and anticipation with the connection between matter and physical action, creates a new kind of art that explored its relationship with the human spirit. A logical deconstruction of matter, not however, by dissolution but rather a kind of a parceling out of its various divisions and constructive scattering of these divisions about the canvas. Outlying the desire of keeping an appearance of matter in search of pure abstraction. The artistic reform creates a different ideology of finding meaning in things as they are. 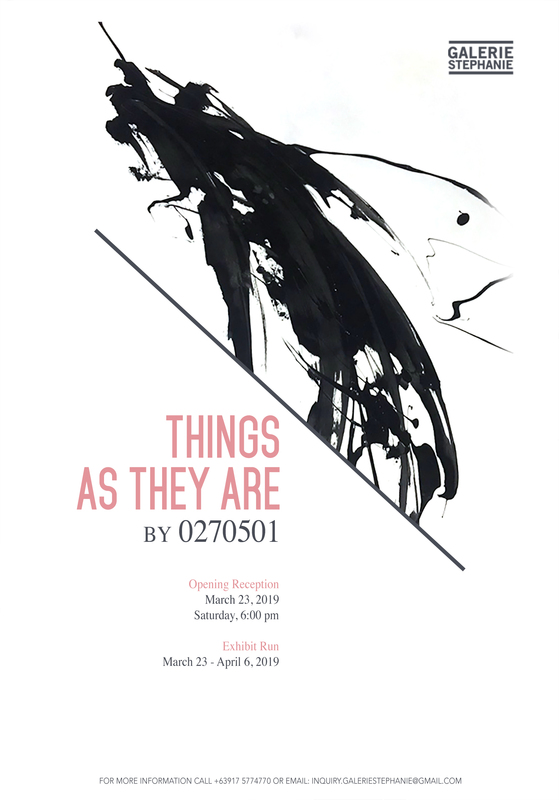 “Things As They Are” will have its opening reception on March 23 (Saturday), 6PM, at Galerie Stephanie, located at the 4th floor East Wing of Shangri-la Plaza, Mandaluyong. The exhibit will be on view until April 6, 2019. For inquiries call (02) 9405726 or email inquiry.galeriestephanie@gmail.com.